If John Boehner Can't Be Rebel Or Compromiser, What's Left? 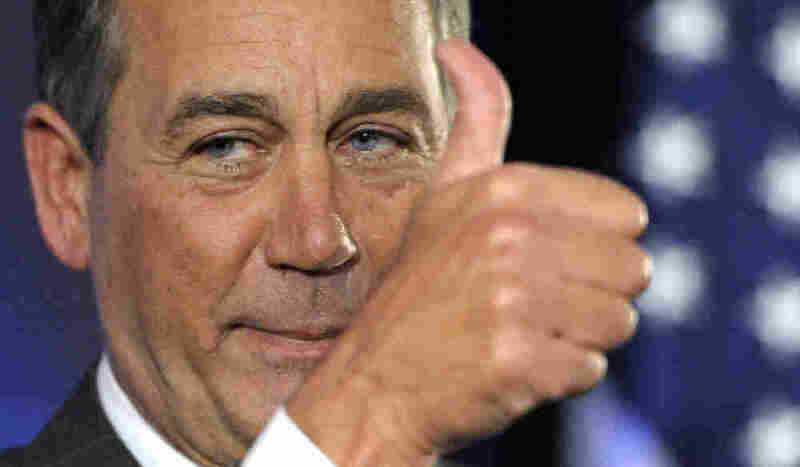 : It's All Politics Boehner tells GOP freshmen they may spend the next 2 years fighting basically fighting Obama. That would seem to rule out him being a compromiser. And the fact that he'll be running Congress rules out a rebel role. So where does that leave him? In her piece on Morning Edition, NPR's Andrea Seabrook asks the question: which of the Rep. John Boehners seen during his congressional career -- the rebel or the compromiser -- will show up as the next speaker? Because he'll be running the place, it's seems unlikely he'll be a rebel; by definition, it's hard to be a revolutionary when you're the top guy in management. Which leaves Boehner the option of being a compromiser. But based on what he told incoming House Republican freshmen Sunday night, it doesn't sound like he has compromise in mind, either. According to The Hill newspaper, Boehner told the freshmen at a dinner to essentially gird for fiscal war with the Obama Administration. Boehner, who will become the new Speaker in the next Congress, told Republicans they may spend the “entire 112th Congress fighting to do just those two things,” according to excerpts of the speech obtained by The Hill. Since the White House and congressional Democrats argue, and not without the support of many economists, that their policies -- the economic stimulus and bailouts -- have saved not just jobs but the entire economy, the Republican and Democratic views are so starkly opposing, any compromise appears impossible. So the most intriguing question for Boehner-watchers is, if he can be neither a rebel or compromiser, what can he be?